Caring for and preserving collections is among the most mission-critical tasks a history organization is charged with. 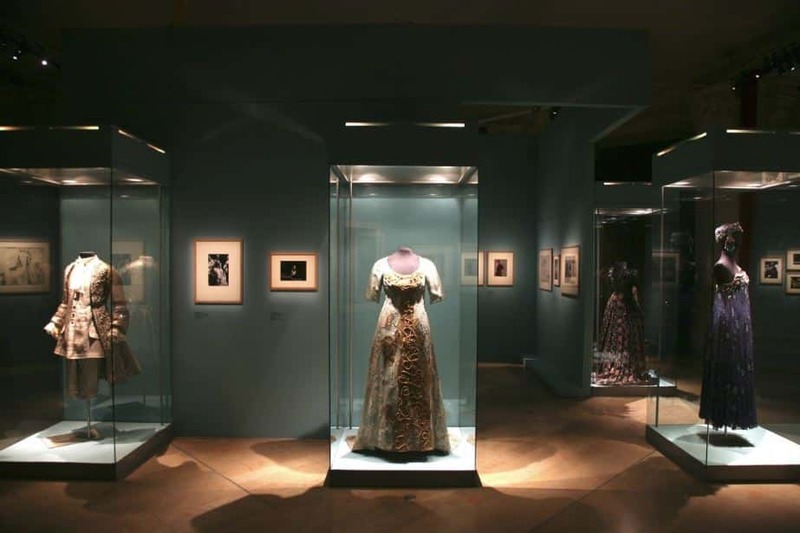 Creating a physical environment that ensures that those collections are preserved for future generations is often the most cost-effective way to address the collection as a whole. In short, it’s cheaper to make sure the collection doesn’t need to be treated for damage than it is to conduct conservation work after the damage is done. Light exposure is among the most pervasive conservation issues that a collection will face. Most of us are aware that light causes damage, but there are still some misconceptions out there about how collections interact with light and how to protect them from its harmful effects. Filters only do half the job. It’s true that there are commercially-produced filters that can be applied to windows and light fixtures, but these filters only protect against the ultraviolet (UV) light on the spectrum. Visible light also causes damage and can only be controlled by the brightness of the light. In other words, zero visible light means total darkness. So, collections stored in a light-proof box are safe from visible light as they are in total darkness, but objects on exhibit, even in dim light conditions, are exposed to visible light. Light damage happens over an extended amount of time. This is apparent from looking at a photograph displayed over time and seeing how it fades. To help slow the accumulated effect, you must manage the exposure in two ways: reducing the intensity (or brightness) of the visible light, and reducing the amount of time it is exposed to that light. Materials that have a high sensitivity to visible light should only be exposed to a maximum of 50,000 lux hours/year. So, if the lights are at a level of 75 lux, then the object can be expected to absorb that light level for 667 hours in a year. Light damage cannot be reversed by conservation treatment. Once it’s done, it’s done. There are low-cost ways to better understand your light levels. The upper images show how inexpensive UV detecting beads can identify the presence of UV light by changing colors. 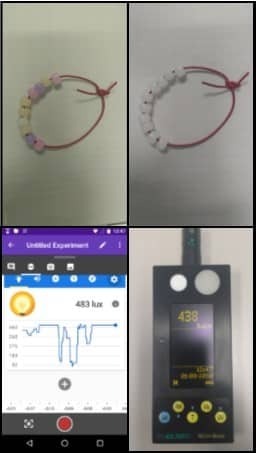 The bottom images are a comparison of the Visible Light readings of a smartphone (left) and an Elsec Environmental Monitor. The smartphone is off by about ten percent. Accurate equipment to measure UV light (measured in microwatts per lumen) and visible light (measured in lux or footcandles) can cost a few thousand dollars, but there are lower cost (although less effective) ways to gain a broad understanding of light levels. For visible light, lower cost light meters designed for photography provide fairly accurate readings of visible light, but don’t measure for UV. Most of us carry a device that measures visible light in our pockets. Smartphones have hardware that measures visible light so it knows when the the phone is put to our ear and prevents our cheeks from pressing buttons on the touch-screen. There are several apps out there that interact with the smartphone’s hardware to display the light readings. To be clear, a smartphone is not a replacement for a light meter, but it can be a useful tool for explaining the need for light management. There are also commercial products available that detect UV light and change colors when it is present. Search on Amazon for “Ultraviolet Detecting Beads.” These beads do not tell the user how much UV is present, but nearly any level of UV should be filtered out, so knowing that it is present at all is important. There are simple ways to display items that reduce overall exposure to light damage. Use window treatments and shades on windows in gallery spaces. Install occupancy sensors (motion detectors) in galleries that turn off the lights automatically. Consider placing copies on exhibit instead of originals, especially for photographs and documents. Here are some further resources to learn more about protecting your collections from light damage.